The private funeral for Army Sgt. La David Johnson, one of four U.S. soldiers killed in Niger, took place Saturday, his tragic death politicized by the president, who continues to feud with a congresswoman who was close to the family. Flags flew at half-staff across the state of Florida as an estimated 1,000 people attended Johnson’s service at Christ the Rock Community Church in Cooper City, Fla., according to CNN. Many more lined the streets of Florida to pay their respects. The American flag draped over Johnson’s casket was folded and given to his pregnant widow, Myeshia, and two other flags were presented to the couple’s daughter and son. 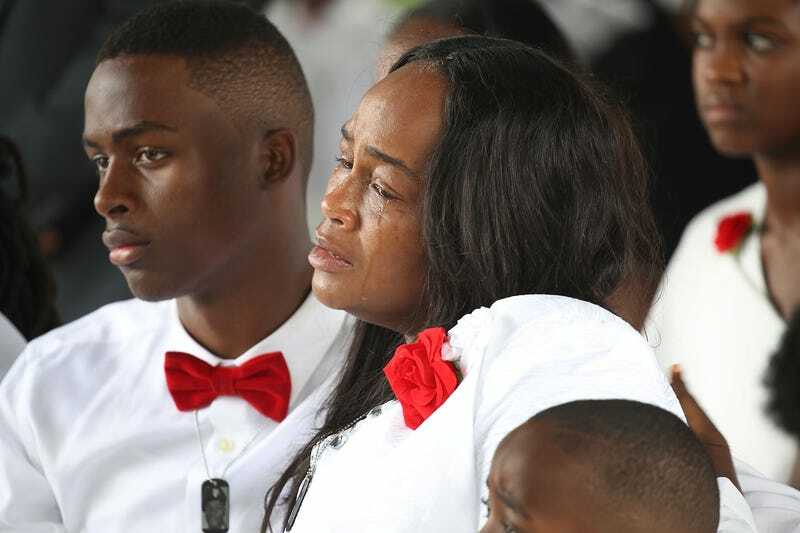 Johnson’s family, who were dressed in white, openly wept over the death of the 25-year-old Army sergeant. Johnson was killed in an Oct. 4 ambush in Niger along with Staff Sgt. Bryan Black, Staff Sgt. Dustin Wright and Staff Sgt. Jeremiah Johnson, as well as five soldiers from Nigeria. U.S. officials were still investigating how the sergeant, whose body was found more than a mile away from the ambush, was separated from (or left by) his team. CNN reports that Johnson, 25, was raised by his aunt and her husband in South Florida after Johnson’s mother died in 1999. Before joining the Army in 2014, Johnson was an employee in the produce department at Walmart, where he became known as “Wheelie King” because he commuted to work on a bicycle with no front wheel, according to his obituary. Unfortunately, Johnson’s death has become the focus of a feud between President Donald Trump and Rep. Frederica Wilson, a Florida Democrat, who spoke at Johnson’s funeral. Trump accused Wilson of fabricating the story, but we all know who the liar is. On the day of Johnson’s funeral, the president continued to tweet about Wilson, calling her “wacky,” which many found to be the height of disrespect as well as a distraction from the unusual circumstances surrounding Johnson’s death. Johnson was also honored at a public wake and memorial service Friday at the Cooper City church.